Kumaun University, Uttarakhand has released the date sheet of Kumaun University Tentative Exam date for B.Com II, B.Com III, B.Sc. II, B.Sc. III, BA II, BA III,,M.COM II, MAII, MA-MATHEMATICS II Annual Examination 2019 for regular and private students. 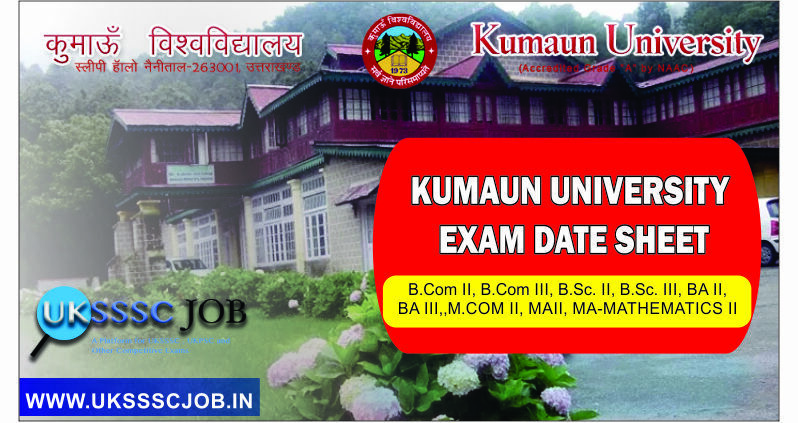 Candidates can check the complete date sheet from the official site of Kumaun University Uttarakhand at http://www.kunainital.ac.in. It is advised that candidates should download the time table and from the official website. 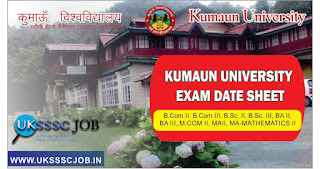 For more update about Kumaun University result 2019 for B.Com II, B.Com III, B.Sc. II, B.Sc. III, BA II, BA III,,M.COM II, MAII, MA-MATHEMATICS II Annual Examination 2019 keep visiting www.ukssscjob.in. The Kumaun University Uttarakhand Annual Exam 2019 will be conducted in the month of April and May 2019. The exam will commence from April 25 and will end on May 10, 2019. The examination will start off with Sociology and Chemistry and will conclude with the optional languages. Tentative exam date of Kumaun University for B.Com II, B.Com III, B.Sc. II, B.Sc. III, BA II, BA III,,M.COM II, MA II, MA-MATHEMATICS II is given below. Candidates can check their exam timetable /Date sheet in PDF format. Visit the official site of the Kumaun University Uttarakhand at http://www.kunainital.ac.in. Click on Annual or Semester Exam Time Table 2019 link available on Homepage. The time table is available in pdf format. Check the exam dates and download it.